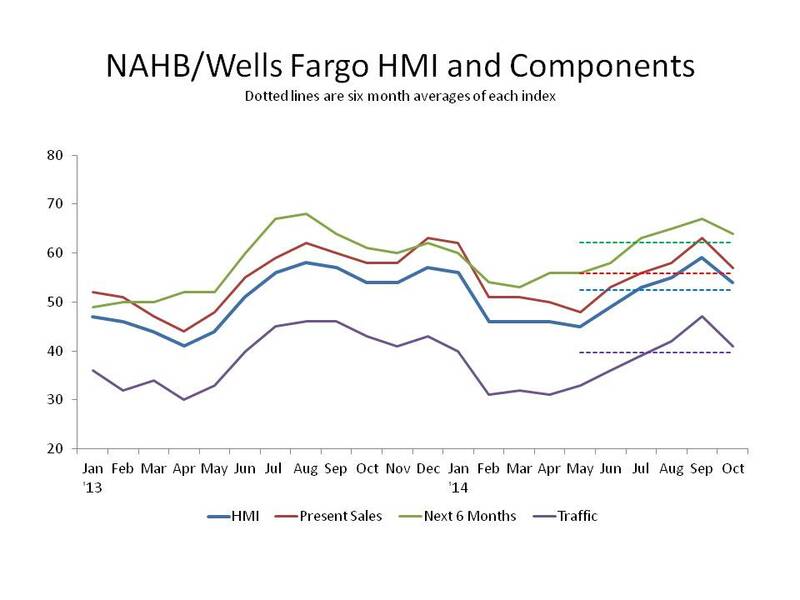 Builder sentiment as measured by the NAHB/Wells Fargo Housing Market Index fell five points in October to a level of 54. Any value above 50 means more builder see the market favorably over those who see unfavorable conditions. The drop was from a 9 year high of 59 in August and returns the index to summer 2014 levels. Conditions across markets continue to vary with some markets, notably those in the oil and energy belt, continuing with positive outlooks whereas markets struggling where employment trends have not been as strong. Builders continue to note shortages of buildable lots and a scattered concern about skilled labor shortages. All three components of the index declined with the current sales index down 6 points to 57, expectations for future sales down 3 points to 64 and traffic down 6 points to 41. In every case, these levels are very close to the July-August 2014 levels. The three month moving averages for the four census regions were relatively steady since they span two similar months (August and October) with a high in September. The housing recovery continues to show the same month to month volatility while generally moving in a positive direction and NAHB expects the trend to continue as mortgage rates remain historically low, house prices rise slowly keeping affordability at a reasonable level and pent-up demand builds. ‹ Where are Nation’s Largest and Most Expensive Lots?